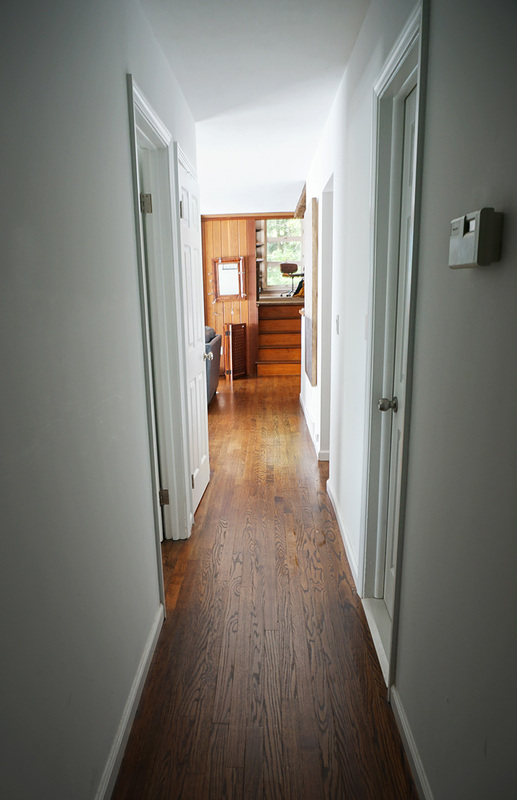 Transition Spaces: Foyers, hallways and stairs, oh my! | Your home, only better. 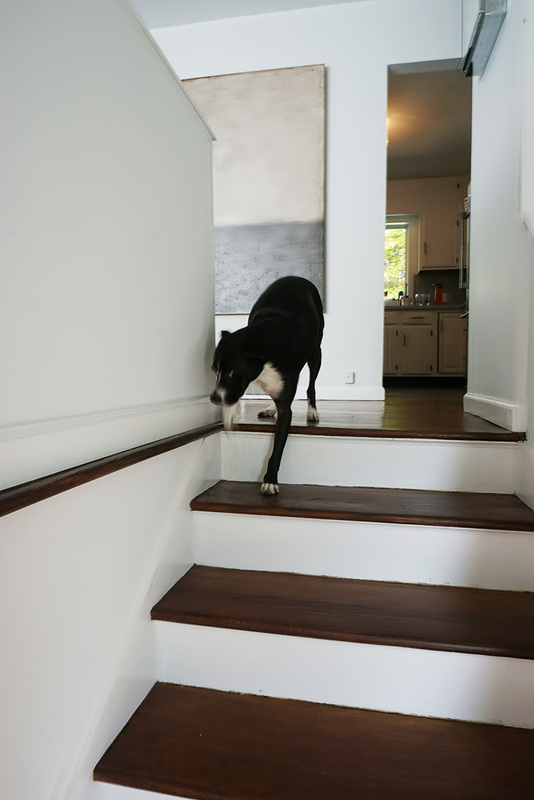 Home » Transition Spaces: Foyers, hallways and stairs, oh my! 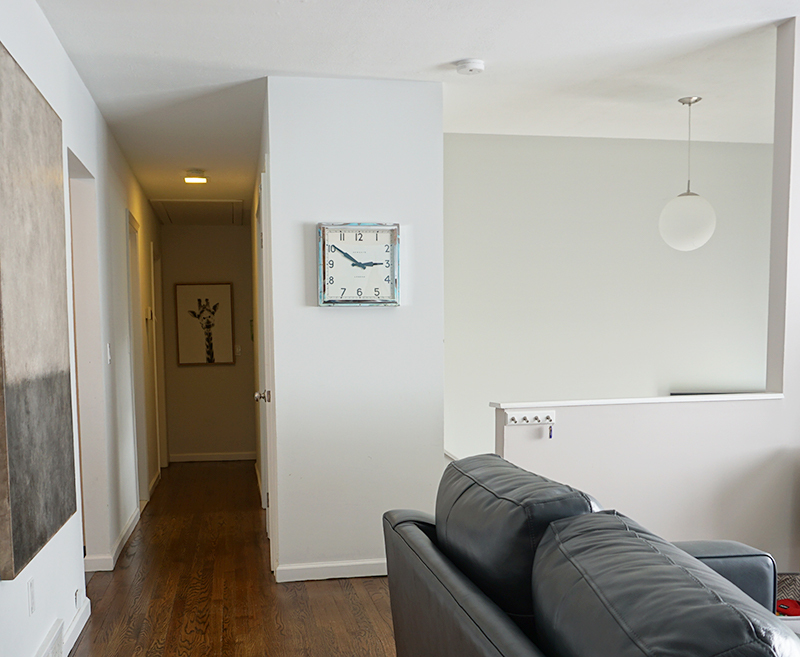 We tend to focus more on the big rooms in our home, but what about the transition spaces you travel through to GET to those rooms? Today we celebrate the hard working foyers, stairs and hallways! It starts with a foyer. Regardless of size, it has a job to do. A good foyer helps you hold it all together and sets the tone for the rest of the house. That’s a lot of pressure. 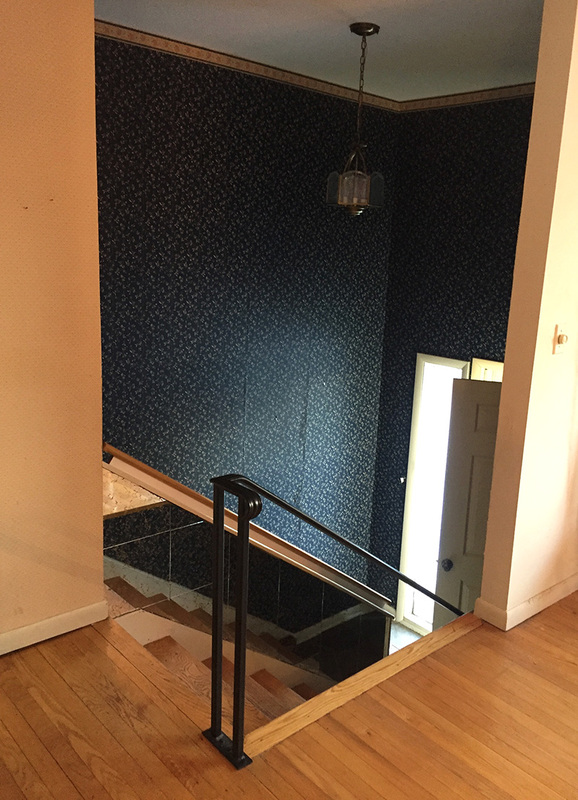 This foyer is a tiny space, with stairs going up to the main level, or down to the basement. Foyers in split levels seem like afterthoughts. I think back to when I first stepped inside my as-is project house. Floral wallpaper, worn out railings, chipped paint on the stairs, some strange stick on mirror tiles that were falling off, and an outdated light fixture. The goal was simply to neutralize. 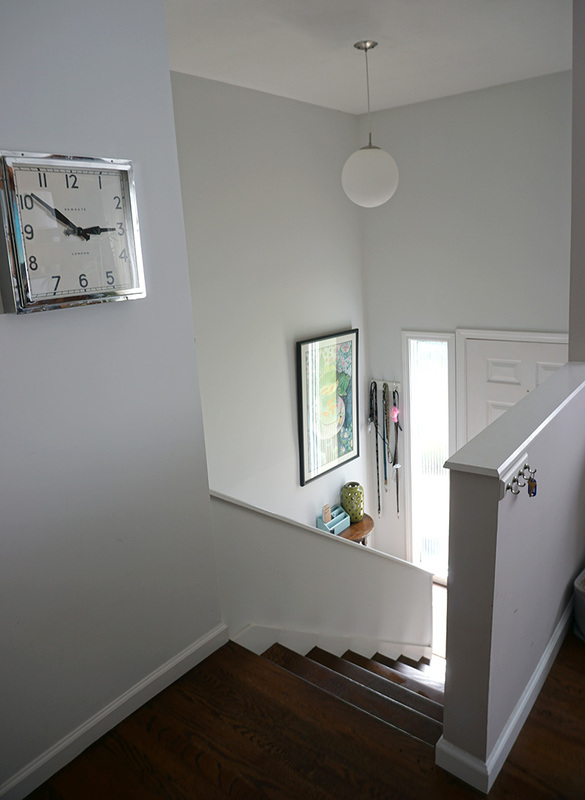 We removed the wallpaper, stained the stair treads and painted the stair risers, removed the mirror tiles and replaced the light fixture. We also replaced the dangerous out-of-code railing with a sturdy half-wall. 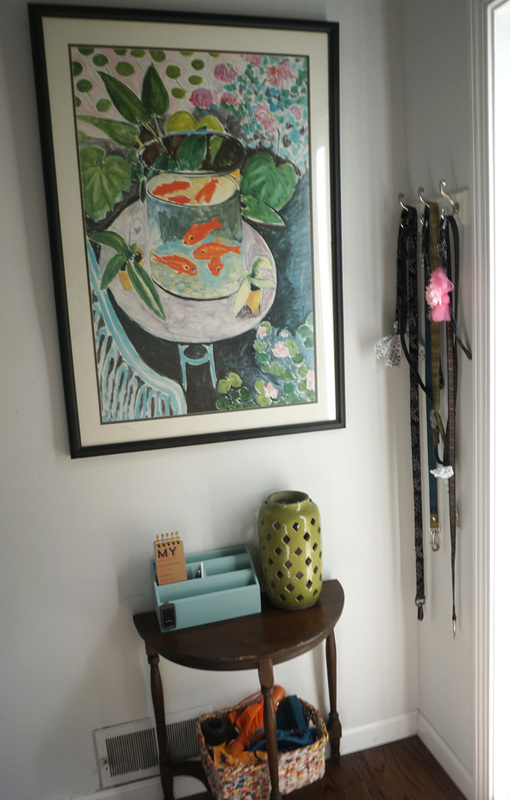 In the small foyer itself, a small half-moon table holds the mail bin and a place for umbrellas and dog accessories. The leashes and collars for the three dogs hang on the wall. 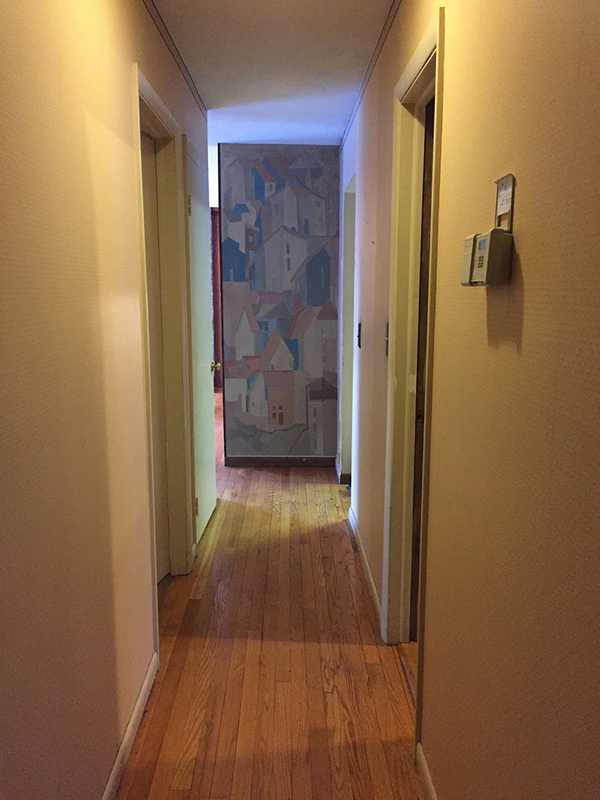 A large Matisse print addressed the scale of the tall wall. The green lantern automatically turns on in the evening so we can make our way to the laundry room without tripping. 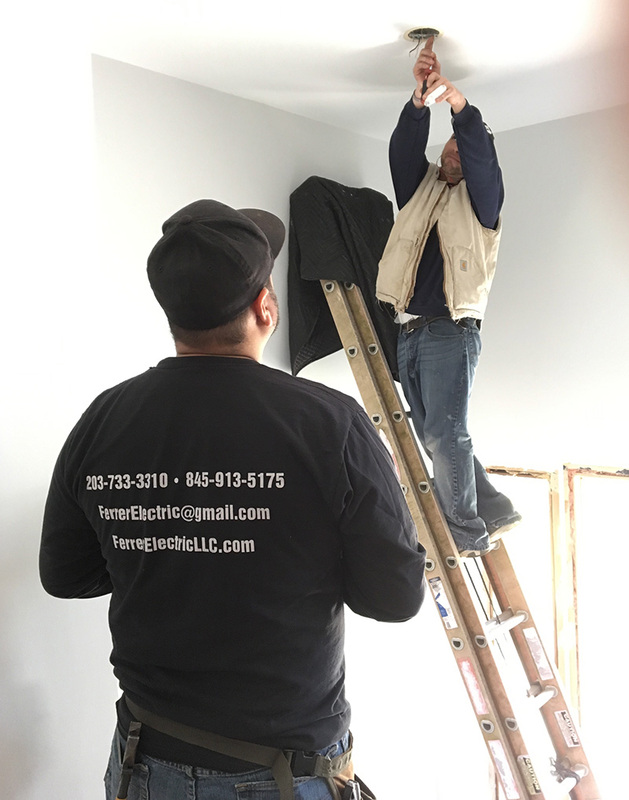 And a shout out to Ferrer Electric who (in addition to upping our amps to 200 and replace almost everything electrical in this house) also installed all new light fixtures. 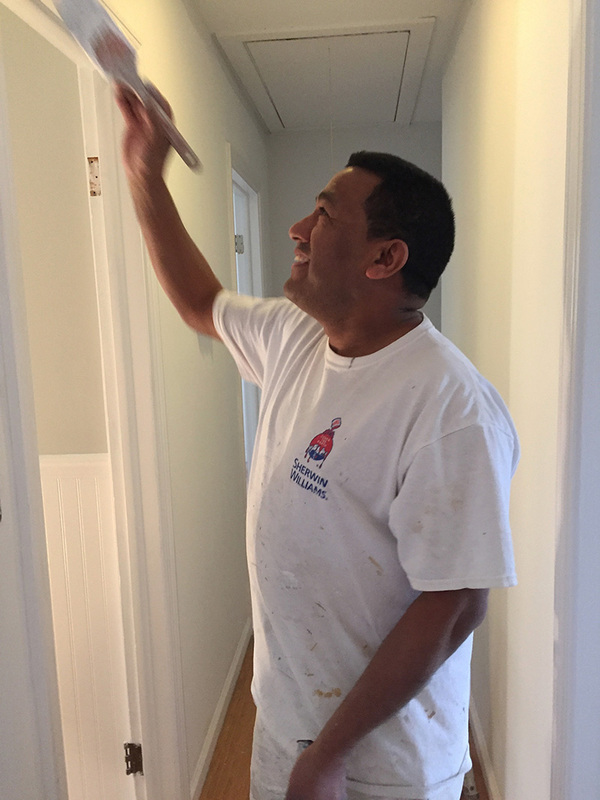 I had many heroes during this project – he was one of them! 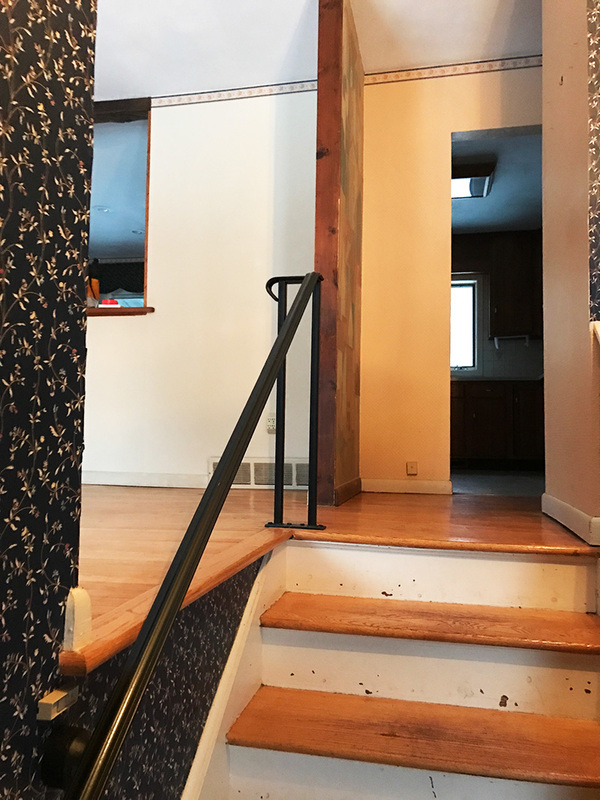 This project reminded me of when I ripped carpet off the stairs a few houses ago, and painted the treads and risers (read about that here). 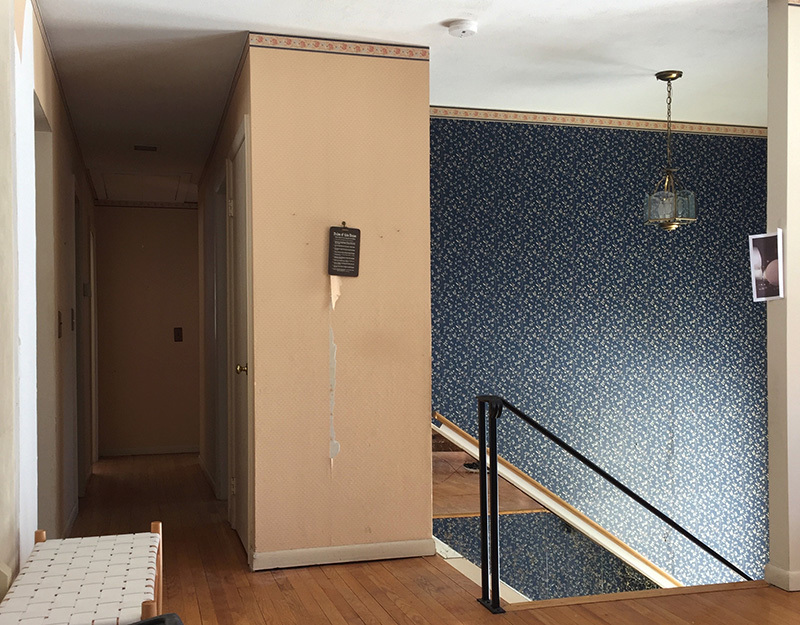 Once upstairs, there is a long hallway that goes to two bedrooms and a hall bath. In addition to mall wallpaper down the hall, there was also a very awkward hand-painted wall at the beginning of the hall. We took that down to better open up the flow of the house. 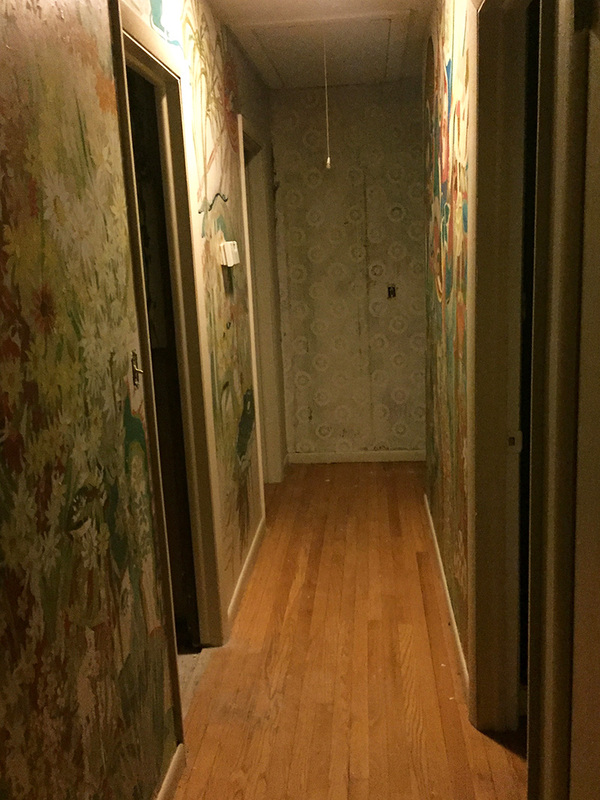 There was another artistic surprise underneath the wallpaper in the hall – full size murals hand-painted on all the walls. 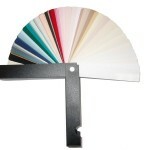 A shout out to Tom Saint and his awesome crew for the many coats of primer and paint to get back to neutral! These guys worked non stop to get me and my girls into this house in just 6 weeks! 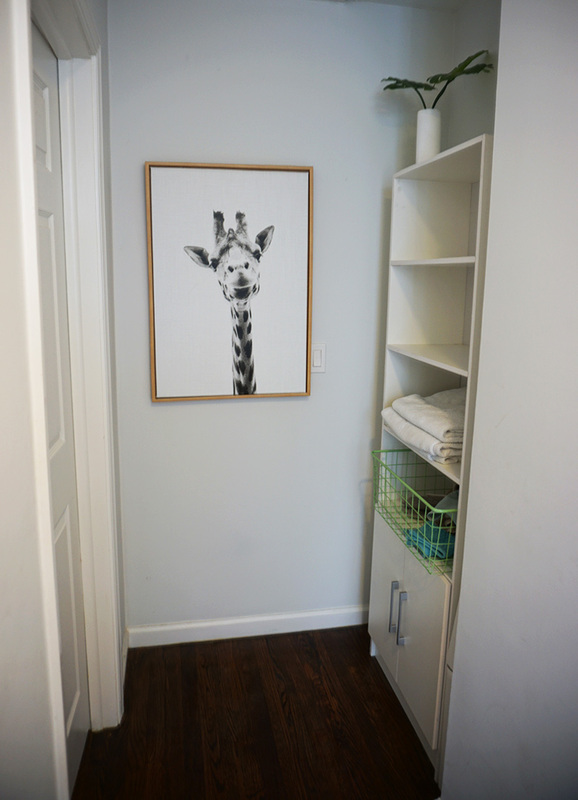 There is a nook at the end of the hall that was perfect for a tall storage unit for towels, etc. As for the giraffe, he makes me smile. Thanks for joining me on this journey of hero spaces that don’t get enough attention. If you haven’t yet, please subscribe below to keep up to date with new posts and projects! 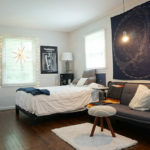 Stage Your Home To Show Big!